Reuse as much of the material from my old benches as possible. I was able to keep just about everything out of the landfill in the end - using the melamine for the top and bottom surfaces and using the 2x4's for other utility construction lumber. Maximize the space available. These go from a non-movable pole on the left to the far wall of the house on the right. Every inch available has been used. 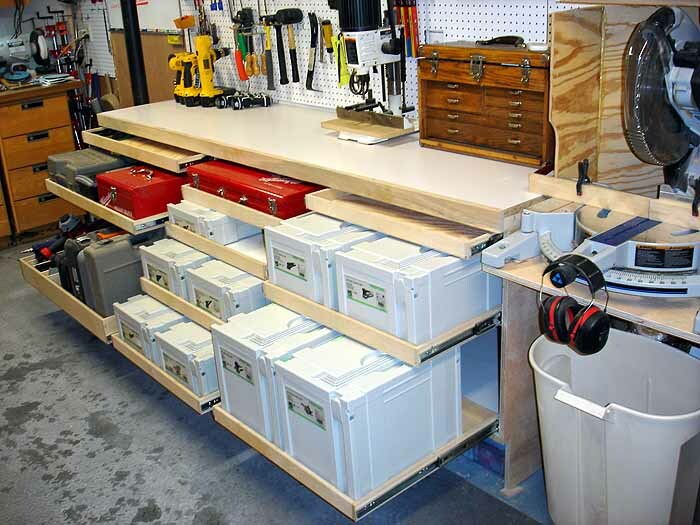 Maximize the storage available within the benches. So I packed almost every cubic inch with drawers on full extension slides. I can't believe how much stuff I have stuffed in this bench, and to my amazement I ended up with leftover drawer space that's unoccupied (for now). I even have storage boxes built into the toe-kick spaces. 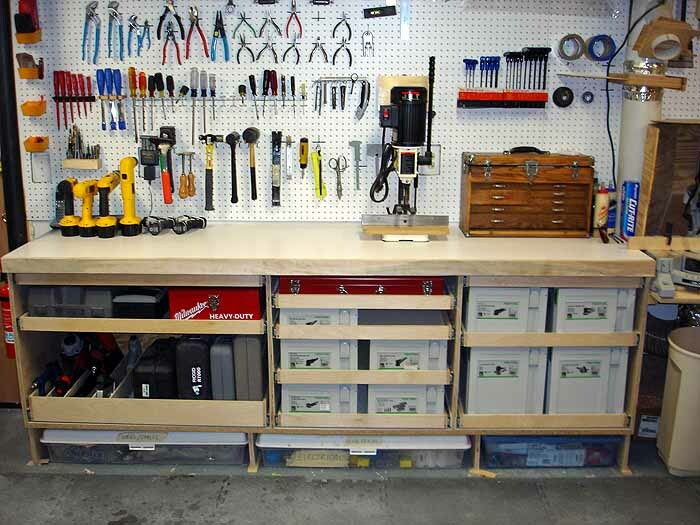 Incorporate my toolboxes to free up the floorspace they were occupying for other things. 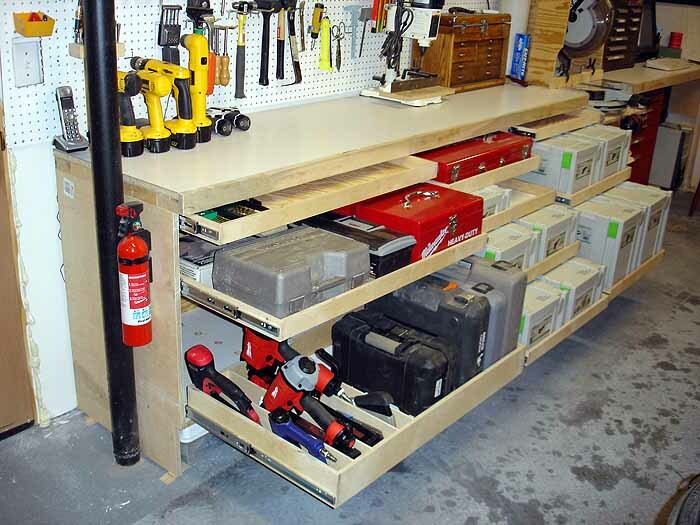 I sized the right side bench around the toolbox base cabinets. They fit nicely down there, and the shallower cabinet (that was the side unit on the base) makes a nice recess for my legs while sitting on the stool working on the PC above it. 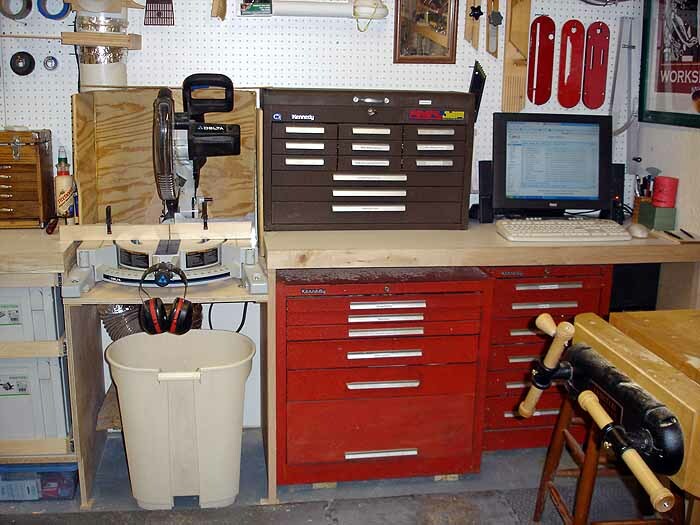 Incorporate my miter saw and keep the benchtops level and coplanar with the saw table. My old bench was never leveled perfectly, but for these benches I borrowed an auto-leveling laser that shot a beam all around the room. I shimmed the bottom of the new benches such that the tops were all nicely level (side to side and front to back) with the laser beam. Use a surface material that is more durable than the melamine I used previously but keep it light. So I used white formica that I glued over the old melamine (after sanding the old melamine top surface). I'm thrilled with the way these turned out. They're everything I hoped and planned for, and since I re-used a lot of material and incorporated a bunch of other leftovers I had on hand they were fairly low cost.